GoPro’s action camera lines may be adept at capturing high-octane footage, but there’s a reason GoPro-shot clips are so regularly overlaid with a backing track: in terms of audio, things aren’t always quite so on point. Sound specialist Sennheiser is looking to change this though, unveiling the first waterproof microphone to earn GoPro’s coveted Works with GoPro stamp of approval. Dubbed the Sennheiser MKE 2, the add-on mic is built into a replacement back for the GoPro Hero4’s waterproof housing, and is capable of capturing impressive sound, even at depth of up to one metre. This isn’t a mic just for GoPro-loving sea dwellers though. It’s also capable of enhancing the cameras audio in a variety of above-water shooting situations. This surprisingly sophisticated bit of kit can be submerged for up to 30 minutes at a time and features an inbuilt shield to help cut out unwanted wind noise, while a clever suspension system prevents the mic picking up noise from its own structure and housing. The Sennheiser MKE2 is available for pre-order right now, with sales to start properly next Monday, April 24. The GoPro-friendly mic will set wannabe owners back a somewhat steep £179.99 ($199.99). 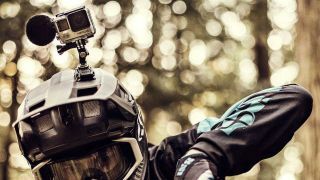 Although the current model is only compatible with the 2015 released GoPro Hero4 Black and Silver models, Sennheiser has confirmed it’s already working on a GoPro Hero5 friendly offering. Want cheap GoPro deals? Then you are in luck.